Laudetur Iesus Christus! We have two events we wanted to share with you occurring over the next few weeks. 1. Feast of the Assumption Tuesday August 15: St. Ann parish will offer a Low Mass, at 7am. Currently that is the only Latin Mass we are aware of that day. 2. Feast of the Holy Cross, Raleigh – September 14: We have a new sister organization in Raleigh, the Tridentine Mass Society of Raleigh and they are hitting the ground running. 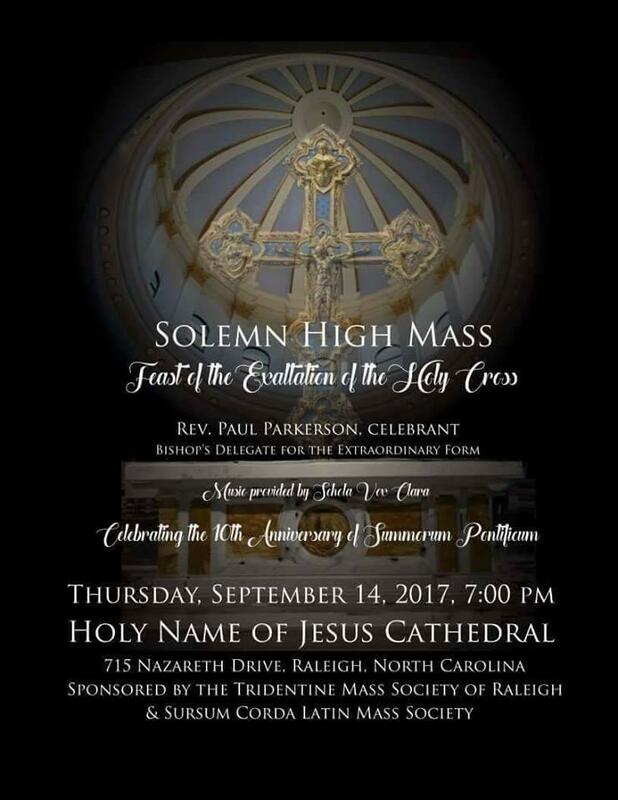 On Thursday September 14th 7pm, they are sponsoring a Solemn High Mass at the new Holy Name of Jesus Cathedral in Raleigh. Please see the attached flyer for details. We will also keep you posted on any Latin Masses closer to Charlotte for that day (if any). As many recall, that will be the 10th anniversary of the implementation of Pope Benedict’s Moto Proprio, Summorum Pontificum, which provided greater access for the Traditional Latin Mass.